Children surround Spc. Matthew Bragg – of B Troop, 1st Squadron, 11th Armored Cavalry Regiment – for a photo opportunity at the 2015 Torrance Armed Forces Day Parade, May 16. 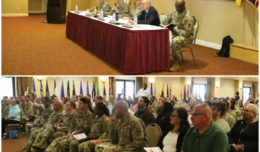 Leadership, Soldiers and civilian employees of this installation participated in a long-held event that brought out tens of thousands to salute and honor military servicemembers, May 15-17. National Training Center and Fort Irwin Commander Brig. 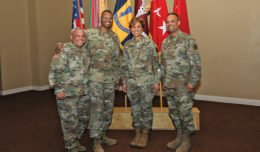 Gen. Joseph Martin, Soldiers of the 11th Armored Cavalry Regiment, and civilians with Directorate of Public Works here supported the 56th Armed Forces Day Celebration hosted by the city of Torrance, Calif. 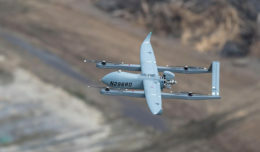 The three-day festivities included military static displays and a parade. 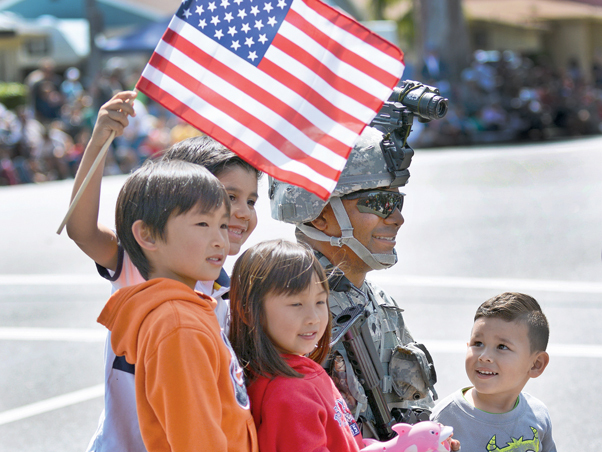 Torrance’s Armed Forces Day Parade has the distinction of being the nation’s longest running military parade sponsored by any city, according to the Torrance Web site. This year, the United States Coast Guard was the honorary service, with a senior leader – Rear Adm. Joseph Sirvidio – serving as grand marshal of the parade, May 16. Sirvidio is commander of the 11th Coast Guard District. Martin took part in the parade, riding in a convertible and later observing floats and saluting military personnel as they passed a reviewing stand for flag officers and other dignitaries. Soldiers of Fort Irwin supported by serving in a joint-services color guard, marching and operating military vehicles in the parade, and speaking with the public at the military exhibit area. Personnel from DPW displayed their environmental exhibit, which included owls, snakes, spiders and other samples of the biological diversity of the NTC terrain. At the military exhibits, Sgt. Thomas Falkowski – a cavalry scout and team leader with Headquarters and Headquarters Troop, 1st Squadron, 11th Armored Cavalry Regiment – and his Soldier, Spc. Thomas Rivers, answered questions about their up-armored humvee (M1151), the M249 weapon in the turret and their personal gear. Falkowski, who has deployed twice to Afghanistan, said the show of support from the public in the parade and exhibit area was immense. “The people were awesome and kind,” Falkowski said. The sergeant said he met people from: Germany (one man who lived through World War II), the Netherlands, Veterans from the Vietnam War and the Persian Gulf War, and a couple from Wisconsin — his home state. Rivers described people’s reactions as extremely happy when they were able to try on his gear, such as the interceptor body armor and advanced combat helmet. Military Veterans were impressed with the advancements made in equipment. Rivers said he was grateful to speak with and hear stories by Veterans and other people. “It was amazing – it was one of the best experiences I’ve ever had,” Rivers said about participating in the three-day event. Sharynn McGee, of Long Beach, Calif., advocated for anyone who has the opportunity, to go see the parade and honor servicemembers and Veterans. She has been present since 2009 and holds a poster-size photograph of her father in his Navy dress uniform. Command Master Chief Richard McGee retired in 1980 after 30 years of service, and died in 2008. Sharynn stands in the same spot on Torrance Boulevard where her father stood in his uniform to watch the procession.